To me, this Butternut Squash Soup says Autumn is here. On a crisp, chilly Fall day, coming home and curling up with a bowl of this soup is as comforting as it gets. Once you get a mouthful of how rich, creamy, and velvety smooth the texture is, you’re never going to believe that a cup is only 155 calories, or only 4 Weight Watchers SmartPoints. 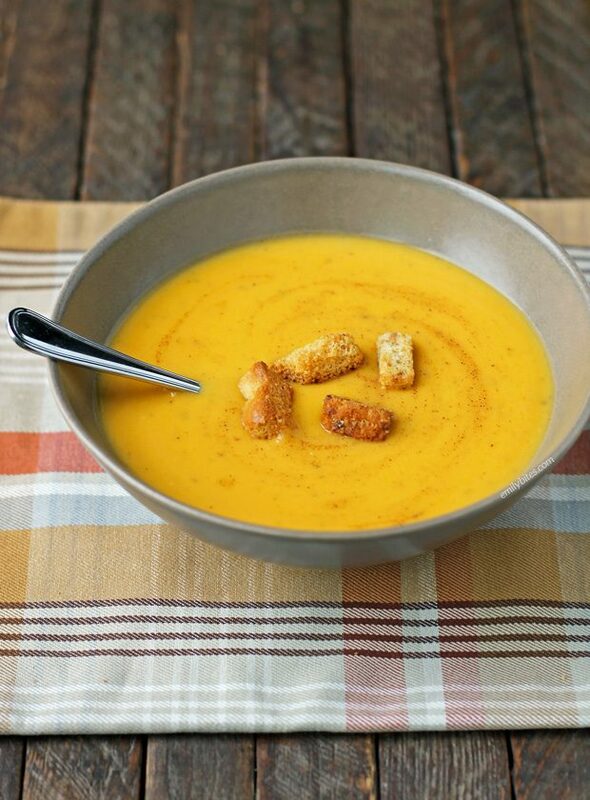 This Butternut Squash Soup is also great to serve company. I recall my mom serving both this and White Chicken Chili along with crusty bread and a big vinaigrette-tossed salad with dried cranberries, nuts and blue cheese to guests for a “soup and salad” dinner and it was a huge hit. I’ve heard that some people have issues peeling/cutting butternut squash. To make it easier, you can poke a few holes and microwave the squash for 2-4 minutes before you cut and peel it to soften it up a bit. If you need more help, here’s a great tutorial! Optional topping: I tossed a few croutons on top of my soup just to give a little layering for the photos. The soup delicious with or without them! They are not included in the nutrition calculations at the bottom, but if you’d like to add them in you can just use the nutrition information on the package. In a large pot, melt the butter over medium-low heat and add the onions. Saute onions for a few minutes until tender. Add the squash, broth, marjoram, pepper and cayenne and stir together. Cover the pot and bring the mixture to a boil. Turn the heat down to a simmer and simmer covered for 20 minutes or until the squash is tender. When soup is done cooking, add the cream cheese and puree the soup completely, either by using an immersion blender directly in the pot or by pouring the soup in batches into a normal blender, until smooth. Sprinkle a bit of Pumpkin Pie Spice on each serving. Cannot wait to try this! Need a good soup! This is probably my favorite soup ever. I hope you love it! Oh goodness this looks great! I just got a huge butternut squash from my mom’s garden and I have been looking for a soup recipe, can’t wait to try it. Although I might omit the dairy to make it vegan. Holy taste buds–this looks amazing!!! It’s so good, Anne, I hope you try it! This looks delicious Emily! We have a similar recipe over on our site http://www.greatbritishchefs.com/recipes/butternut-squash-soup-recipe but it doesn’t include the cream cheese, I will have to give that a try. 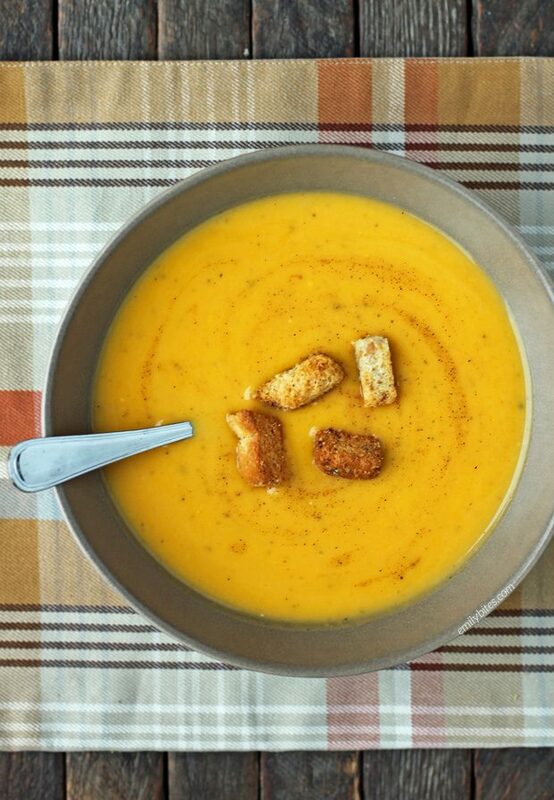 Yup, there’s a lot of Butternut Squash Soup recipes out there. This recipe is the best one I’ve ever tasted, you should try it! Made this tonight ……absolutely delicious! Thanks for all the fantastic recipes. I have tried many of them and they have all been fantastic! I actually put in 1/2 a canned chipotle pepper in my butternut squash soup – its the perfect balance of sweet and spicy! Can anyone tell me if six cups cubed butternut squash comes out to one large squash, or will I need to buy two? Thanks! One large one (2 lbs or more) should be perfect! I made this tonight and it was awesome! I doubled it, and the only change I made was using a little less butter. It was rich tasting, and delicious! My husband didn’t want to sprinkle pumpkin pie spice on his, but I did and it was great! Really great recipe that’s sure to be a repeat often here at my home, particularly in the fall. Thanks so much!!! I’m so glad you tried it and loved it! I doubled this when I made it last night. It is soooo good. I didn’t add pumpkin pie spice. I am savory not sweet. I added siricha. Just the right balance. Definately will be a favorite. My husband turned his nose when I told him what I was making…needless to say, he changed his mind. This soup is really really delightful! Do you think this would be ok with frozen squash? Normally I’d always go for fresh – but I have a couple bags of frozen I would love to use up! I’ve never tried it that way but I don’t see why not! This looks so perfect for fall! I love squash and I love that there is 3 grams of fiber per serving in this soup. Definitely adding it to my meal plan this week. I hope you love it! It’s one of my favorite recipes. I just finished making this! The taste I had was AMAZING!!! I can’t wait to eat it for dinner tomorrow night!!! Instead of dealing with trying to cube the firm squash, cut it in half lengthways, seed, and place cut side down on a baking sheet. Roast it the oven until tender. It adds to the flavor and you’ll be able to scoop out the meat of the squash quite easily. No peeling needed. This was absolutely delicious. I cannot wait to make this again. So creamy and filling. PERFECT for fall. Thank you so much!! Thanks for another great recipe! I bought such a big squash that I only needed half for the recipe (and that measured 8 cups!). I roasted the other half. My question for you is why cube and boil? Can it be made using the roasted squash also? If you tried that, let me know. Otherwise round two will be made with the roasted squash. This sounds yummy! Can’t wait to try it! I’m new to cooking still and this may be a silly question but what is marjoram and where can I find it? Thanks! Marjoram is a spice…I found mine on the dry spice aisle in my store! This soup came out so delicious! I’m so happy to have found your website! Thank you so much! I have been thinking as fall has set in I need to try more soups ever since getting your blog from a fellow WW buddy every time I want to try something new I check your index and low and behold here this is a recipe for all the things I grabbed at the farmers market and wondered what the heck am I going to do with this. I can’t wait to see how it goes I am so glad I found your blog before I did my specialty was grilled whatever and tacos lol and before that my specialty was dialing pizza hut. I am so excited to start cooking and make simple and delicious recipes I cant wait to see what you have planned next! I made this and it is, by far, the most delicious and easiest butternut squash soup I have EVER made or ever had in a restaurant. The more complex recipes I’ve tried never tasted half as good as this. I am in love. It is so velvety smooth and delicious it’d be good as a pasta sauce as well. I’m so glad to hear you loved it so much!! This is one of my all-time favorite recipes, so it makes me extra happy when it gets love. I never thought of using it as a pasta sauce – what a cool idea! Thanks for your comment! A few years ago I had pumpkin soup while on board a cruise ship. Such things aren’t so common down here in Southeast Texas but I thought it was extremely good. This year after trying your Stuffed Acorn Squash recipe I got directed to this recipe and made me thing longingly about that soup. I thought this might be a good substitute for that pumpkin soup that I longed for. No, this wasn’t a substitute at all. This was so much better. My wife, who isn’t as adventurous eater as I, was extremely skeptical that she would like it. Nevertheless, she tried it and she loved it as well. This would have been considered a grand slam in this household. I may have to make up a few batches and freeze them for later use. I am in love with this recipe!!! This soup is absolutely fabulous! I’m impressed. I don’t think I’ve met anyone who knows as much about this subject as you do. You’re truly well informed and very intelligent. Today is so cold this looks so good to make. Thank you for sharing this delish recipe. I am overwhelmed by your post with such a nice topic. Usually I visit your blogs and get updated through the information you include but today’s blog would be the most appreciable. It is that time of year when squash soup becomes king. I like to add a little curry powder instead of the squash pie seasonings for a change of pace. There is a much easier way to deal with the squash. Cut it in half lengthwise, brush the flesh with olive oil and place down on a cookie sheet. Bake for 30-45 minutes in a 350° oven. When cooked, scoop out the seeds, peel the squash or scoop out the flesh with a spoon. Delicious soup! Made this soup today and it is so delicious! Definately a keeper! I made this for dinner last night and it was delicious!! I added some chopped garlic while I was sauteing the onions and swapped thyme for the marjoram. I deglazed the pan with a little wine. I was kind of short on squash so I made up the volume with some baby carrots I had. It was so easy and my husband was raving about it all night! Thanks for a great recipe! Does it mess up the recipe to use chicken broth? I don’t have vegetable. Thanks! Hi! Lools delish and I cannot wait to try it. However, FYI, I input it into my recipe builder in Weight Watchers, as I was unsure if the points you list were for the new Freestyle Program. Anyway, I got 5 points per serving. 6 servings. The only ingredients that had points were: 4 T Light Butter 14 pts, Fat Free Reduced Sodium Vegetable Broth 2 points for 3 cups, 4 oz Neufchatel Cheese 12 points (which is 1/3 less fat cream cheese, Philadelphia 1/3 less fat also came up as 12 points). I titled the recipe Emily Bites Butternut Squash Soup. Not sure if you can search it or not. Anyway, just wondering if I input an ingredient incorrectly based on your recipe. Thanks! Hi Karen, I always use Land O’Lakes light butter and it is significant;y less SPs than the generic listing for light butter. I’ll bet that’s it! Made this last night and my husband and I both loved it. I used chicken broth since it’s what I had on hand, and sprinkled a little nutmeg on top of each serving. It was delicious and tasted like it took a lot more time than it actually did! This is my favorite butternut squash soup and it’s SO EASY! I recently purchased an electric pressure cooker and I thought I would try to make this in it. I sauteed the butter with the onions, then added my squash, spices, and broth, and cooked at high pressure for 7min. I let the pressure release naturally due to time constraints, but I’m sure a quick release would work as well. Then I added in the cream cheese and blended with and immersion blender. Still perfect!!! Thanks so much for this recipe! Just made it tonight. However, I used chicken stock (didn’t have vegetable stock at hand). I also added some Allspice which for me gave it more warmth and depth of flavor. This is a great recipe and my family really enjoyed it. Thank you for sharing it.